Last Gasp: Your opponent summons a 2/1 Mournhold Guardian with Guard. 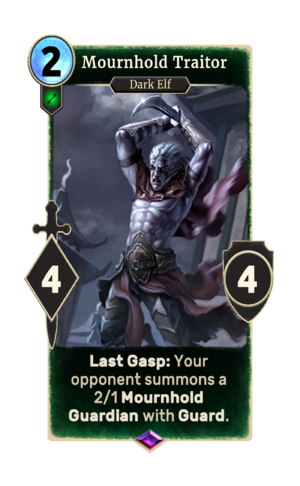 Mournhold Traitor is an epic Agility creature card. It is part of the Core Set. "Of course I'm on your side..."
"Didn't see this coming, eh?" "One bad turn... deserves... another... <groan>"
This page was last modified on 25 February 2019, at 01:31.